When his dad dropped him off in the middle of nowhere on a patch of Georgia land, Tyler Ross ’09 thought he would be alone for the next six months. First catching the travel bug in Europe, he never stopped moving. Though rarely alone, the transformation on the trail was as internal as it was external. Preparing physically wasn’t on his to do list; mental preparation is not possible. His first excursion, 2,175 miles of the Appalachian Trail on foot, was also where he met fellow adventurer Quinn. 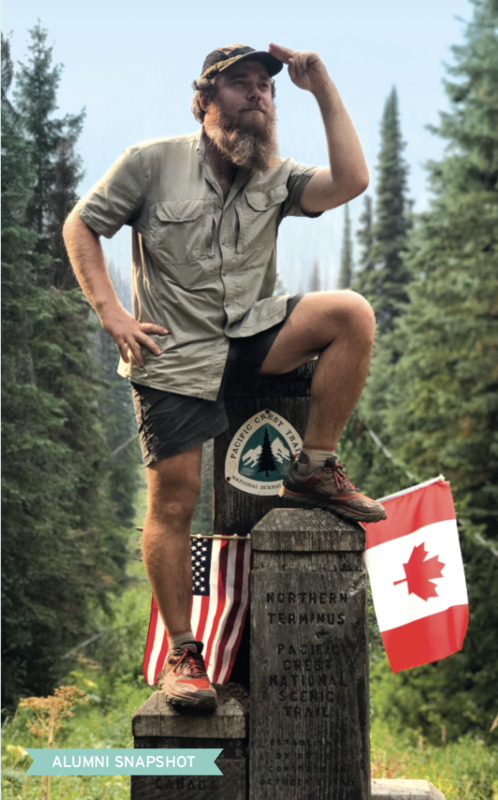 Together they would complete two more trails: 4,014 miles on bike from Seattle to Key West, Fla., and the Pacific Crest Trail, another 2,650 miles on foot. Ross’ degree in economics and finance helped him start Chicago Cafe in Florence, Ala. with a close friend six years ago. They saved up their paychecks from 80-hour work weeks—“barely living” he called it—and purchased the restaurant next door called Wildwood Tavern, a creation of their own. While traveling along the Appalachian Trail, he began to feel sick. Sickness began to cripple him from within—forcing him to slow to the point of stopping. The nearest stop ahead was too far, but the road behind was an option. He turned around and headed back for help. “I drank out of a mud puddle, said Ross. “That was a low point.” He reached the road, at this point crawling to get into eye-shot. He put his thumb out and passed out before someone shook him awake and gave him a ride to the hospital. “I look in the backseat, and there is an Elvis suit and Elvis glasses,” Ross said. “I look at him and say, ‘Elvis impersonator?’ and he says ‘Hold on’.” Thirty seconds later, Ross looked up to see his rescuer plastered on a billboard advertising Elvis impersonations. Ross got to the hospital just in time to find out he had contracted Lyme Disease. Now back home, Ross said he is trying to “figure out what the hell is next.” Looking into starting his next businesses in other cities to create cushion for an early retirement, Ross wants to sail the world in a sailboat, an endeavor he’d like to plan for in the next 10 years.